Castaway Cay is definitely the most beautiful place i've ever visited, and somewhere that i've always dreamt about visiting! I remember looking through holiday brochures and reading about this island, thinking that it looked like absolute paradise! It was such a dream come true stepping off the cruise and onto this beautiful island, I've never seen such clear turquoise waters! Castaway Cay is Walt Disney World's own private island and is reserved exclusively for Disney guests travelling on the Disney Cruise Line. We spent four days travelling around the Bahamian islands, Castaway Cay being one of our ports of call! We spent the whole day exploring the island! 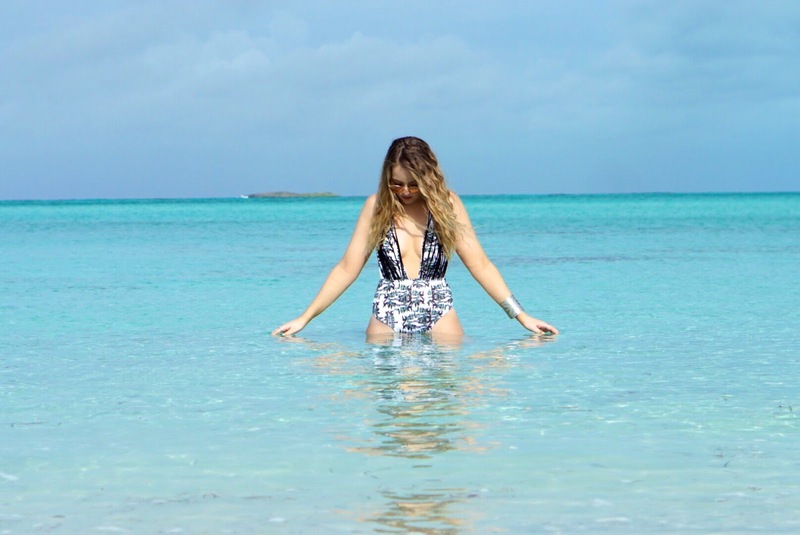 When I saw this swimsuit on ASOS, I knew it would be the perfect piece to wear around the island! I love tropical themed swimwear, it's perfect especially for a Caribbean beach day. I love the palm tree pattern all over this swimsuit and the deep plunge neckline, something that I would never normally be brave enough to wear, but I now love especially for a holiday! I got this swimsuit from ASOS a couple of months ago but I have linked a few tropical themed swimwear pieces down below that are now avaliable. I also wore my favourite Missguided Ripped Hem High Waisted Denim Shorts around the island and my Ray Ban Round Sunglasses in 'Copper Flash' which as you know, are my all time favourite sunglasses that I am absolutely obsessed with! I finished off my look with the most important accessory, my Minnie Mouse ears! These are an essential because we were on a Disney island! I always love the photography in your posts and you look gorgeous as always! Lydia you look AMAZING in that swimwear. I want that and the sunglasses - these are gorgeous photos. So many stunning things happening all in one post; that swimsuit, you are a beach goddess, and the photography! The water looks so clear and blue... so jealous and I wish I could be there! I love your anklets! all of your pictures looking gorgeous.you are really beautiful. thanks for sharing your awesome post. Congratulations guys, quality information you have given!! !..Its really useful blog. Thanks for sharing this useful information. I like this very much, I love it.